The core teachings of Buddhism are straightforward and practical: nothing is fixed or permanent; actions have consequences; we can all change. Buddhism is a path of change, of spiritual development gradually leading to true freedom: the development of a profoundly calm and compassionate mind and insight into the nature of our reality. Due to the 2500 years in which Buddhism spread throughout Asia – and during the last century even all over the world – Buddhism developed in widely varying ways in different cultures. But all Buddhist traditions offer teachings and practices which are a means of changing oneself in order to develop the qualities of kindness, compassion, empathy and equanimity; leading ultimately to the realisation of Buddhahood – the full unfolding of the potential of each and every person. Because Buddhism does not include the worship of a creator god, some people do not see it as a religion in the traditional, Western sense. Buddhism shares characteristics with religion, philosophy and science alike, yet cannot be reduced to any of these. Therefore, Buddhism has an unusual position within the European religious, philosophical and scientific landscape. Like other religions, Buddhism challenges us to ask some of the deepest possible existential questions. It also has temples, lay people, monks, nuns, ordination, rituals and prayer; and it offers meditation and spiritual training. On the other hand, like philosophy, Buddhist methodology is non-dogmatic and follows rigorous logical analysis. It is empirical and embedded in a non-theistic tradition, as is science. Hence, Buddhism can shed a fresh light on our preconceptions and traditional definitions (definitions of religion in particular), which may result in a better understanding. Some of the core teachings of the Buddha are known as the ‘Four Seals of Dharma’, the four fundamental discoveries he made in the process of his Enlightenment, under the Bodhi Tree. These four seals are central to the teaching of most Buddhist schools, but their interpretation, formulation and emphasis vary. Anitya (Pali: Anicca): impermanence All things are in a constant state of flux. In other words: all compounded phenomena are impermanent. Duhkha (Pali: Dukkha): unsatisfactoriness Although life is full of beautiful or enjoyable things and experiences, they are all impermanent and insubstantial and therefore sooner or later we experience them as frustrating or painful. Anatman (Pali: Anatta): non-self Nothing has an eternal, independently existing, unchanging soul or essence. In other words: all things have no inherent existence. The fourth seal is probably the best-known Buddhist term in the West, but is also the hardest to define, being beyond the limitations of language and concepts. Nirvana (Pali: Nibbana): Enlightenment It is possible to awaken to a state of being in which one is utterly permeated by an understanding of the nature of existence; a state of tranquility with an un-biased view of life, in which all impulses to greed or hatred have been transcended. Due to the 2500 years in which Buddhism spread throughout Asia, Buddhism developed in widely varying ways in different (Asian) cultures. Over the centuries, many different classifications of various traditions have been made, some emphasising geographical and cultural differences, others emphasising doctrinal and historical differences. 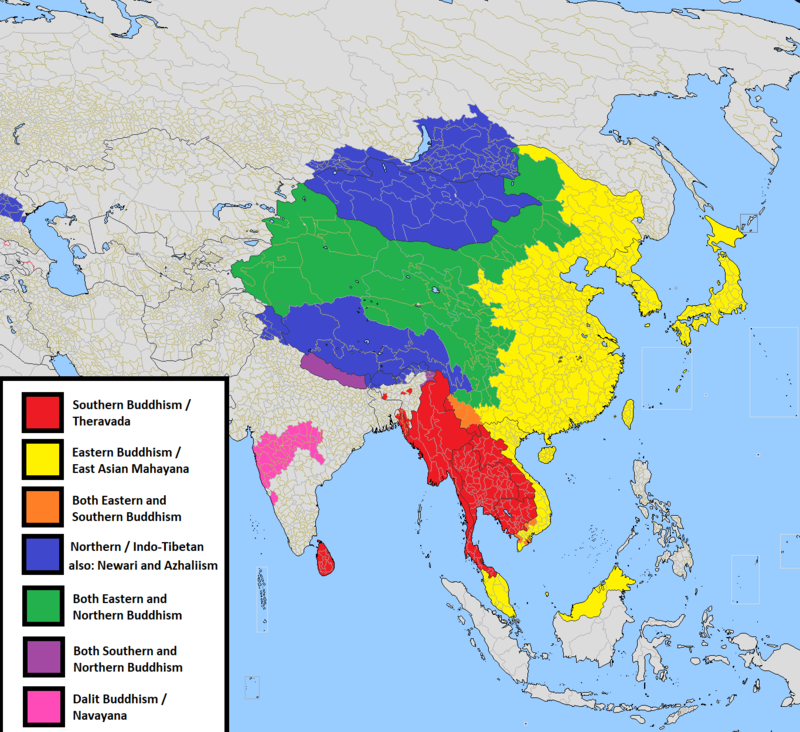 At present, the most commonly used classification divides most existing traditions into three mainstreams: Theravada (The School of the Elders – including the South Asian Buddhism of countries such as Sri Lanka, Myanmar, Laos, Cambodia and Thailand), Mahayana (The Great Vehicle – including Pure Land and Chan/Zen Buddhism in countries such as China, Vietnam, Korea and Japan) and Vajrayana (The Diamond Vehicle, also called Tantrayana – including Buddhism from Tibet, Bhutan, Mongolia and the (European) Republic of Kalmykia in Russia). Some more recent traditions from the 20th century (for example the Indian Ambedkar-movement, Triratna and Jai Bhim), do not fit in this classification. For over a century, Buddhism has been spreading to the West and, in doing so, it is becoming a global religion. During the last decades this initiated the debate what is essential, universal about the Dharma and what is a local, cultural expression of this universal teaching. A similar debate has been taking place for much longer when Christianity, esp. the Roman Catholic tradition, became a global religion. The question in how far the Roman liturgy and dogma’s were expressed in European wording and images is called enculturation. In other words, enculturation is the question in how far ideas and rituals that for millennia have been vocalised and expressed in a European context, can (or cannot) be adapted to a non-Christian cultural background. The more Buddhism is taking root in the West, the more similar questions arise in a Buddhist context. This Buddhist enculturation process is relatively young and will undoubtably give rise to a fascinating and interesting debate for many decades to come. As an example, and food for thought, we give a summary of some ideas on this topic by Dzongsar Jamyang Khyentse: What makes you (not) a Buddhist?